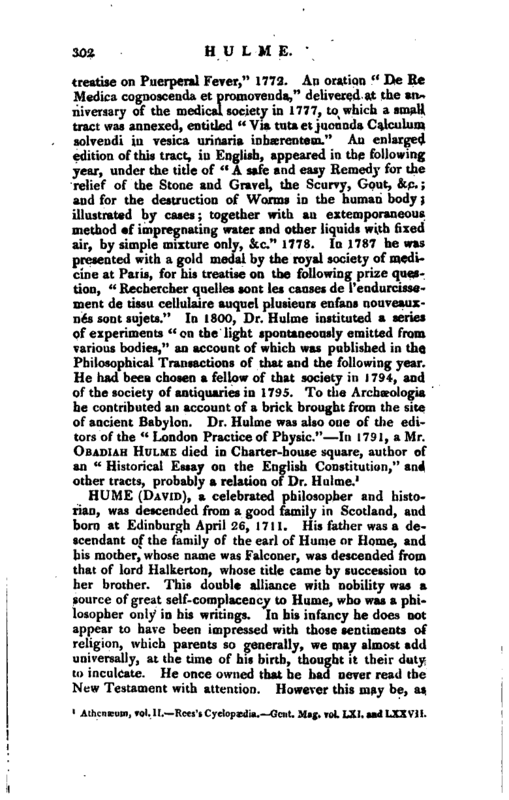 , an English physician, was born at Holme Torp in Yorkshire, June 17, 1732, and was taught the rudiments of medical science by his brother, Dr. Joseph Hulme, an eminent physician at Halifax, and afterwards was a pupil at Guy’s hospital. In 1755, he served in the capacity of surgeon in the navy, and being stationed at Leith after the peace of 1763, he embraced the favourable opportunity of prosecuting his medical studies at Edinburgh, where he took his degree of doctor in 1765. His inaugural thesis was entitled “Dissertatio Medica Inauguralis de Scorbuto.” Soon after his graduation, he settled in London as a physician, intending to devote his attention particularly to the practice of midwifery. This, however, he soon relinquished: and, on the establishment of the general dispensary (the first institution of the kind in London), he was appointed its first physician. He was also some time physician to the City of London Lying-in hospital. About 1774, he was, through the influence of lord Sandwich, then first lord of the admiralty, elected physician to the Charter-house His other official situations he resigned many years before his death, and withdrew himself at the same time in a great measure from the active exercise of his profession; but continued in the Charter-house during the remainder of his life. 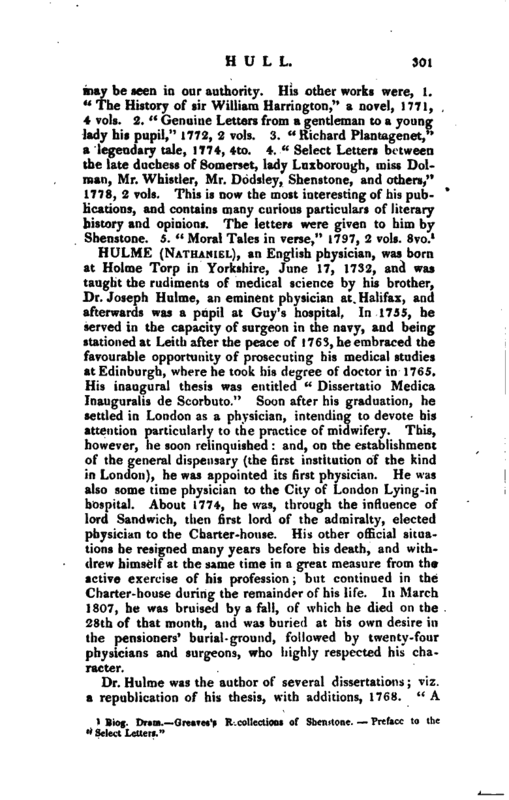 In March 1807, he was bruised by a fall, of which he died on the 28th of that month, and was buried at his own desire in the pensioners’ burial ground, followed by twenty-four physicians and surgeons, who highly respected his character. Athenæum, vol. II.—Rees’s Cyclopædia.—Gent. Mag. vol. LXI. and LXXVII.